Two main courses, Tostadas De Piccadillo: Tostadas with picadillo (ground beef), pickled red onion, watercress, crema, and salsa verde ($7.95) and Homemade Chicken Tamales with Romesco Sauce ($2.50), both inspired by Nopalito: A Mexican Kitchen (2018 James Beard Foundation Cookbook Award Winner) will also be offered. “Having the City of Chicago, along with Choose Chicago and the Illinois Restaurant Association host The James Beard Foundation for its 29th Annual James Beard Awards is a huge vote of confidence recognizing Chicago as a culinary center.” added Schulman. Only available April 26-May 6, Monday-Friday, 11am-2pm at Eli’s Cheesecake Cafe, 6701 W. Forest Preserve Drive in Chicago. Please call 773-205-3800 for more information, or for reservations. Eli’s Cheesecake’s Chef Antonio, along with President Marc Schulman and our associates Juana, Juana, Mary, Jessica, and Maria had the privilege to serve a wonderful dinner to the guests at the Chicago Help Initiative (CHI) on Wednesday, April 4th. Thank you to our amazing associates for preparing a delicious barbecue dinner and serving our Hot Chocolate Cheesecake for dessert. CHI began in November of 1999 when local Realtor Jacqueline B. Hayes invited various volunteers from her community to work together to provide for the increasing number of homeless in the area. CHI provides access to food, health services, shelter and employment, and educates our neighbors on how to help the homeless and disadvantaged, with dignity and compassion. Eli’s the Place for Steak was the first restaurant to provide dinner when the group was first founded. We are a favorite of the guests for the quality of the food, dessert, and service. We also welcomed representatives of American Airlines from O’Hare Airport, who helped with arrangements and serving the guests. Eli’s has been honored to provide food for this event for the past 20 years and we look forward to a long partnership in the future. Visit the Chicago Help Initiative to learn more. Pi Day has Infinite Possibilities at Eli’s: Pies and Pie Fights! 3.14 will be a Pietastic Day at Eli’s Cheesecake with mini pies, ice cream a la pie and Pookies…a new creation that’s part pie, part cookie! We’ll also be screening famous television and movie pie fights in our cafe. Eli’s has baked up mini fruit pies, Apple or Cherry, to be served as individual treats, or on top of a scoop of vanilla ice cream (the opposite of pie a la mode). And be among the first to try Eli’s new Pookies.…a delicious all butter cookie dough topped with housemade apple or strawberry pie filling. Eli’s Pi Day Flight includes three mini pies (Apple, Strawberry, and Blueberry) served warm, with ice cream, housemade sauces and accoutrements. Dine-in only. Eli’s Pi day specials will be served at Eli’s Cafe, located at 6701 W. Forest Preserve Drive on Thursday, March 14 from 8:00 AM to 6:00 PM, and are available for local delivery (Chicago and suburbs). Shipping deadline for mail order mini pies is Tuesday, March 12 for second day and Wednesday, March 13 for overnight delivery. Mini Pies, Apple or Cherry: $.75 each, 3 for $2. Ala mode, $1.50. Mini Pi Flight, $3.14. Eli’s was delighted to host the 2019 St. Patrick’s Day Parade Queen, Madeline Mitchell, and her Court, along with Green River Soda on March 8th. The queen and her court started their morning next door at the New Horizon Center to visit the students. While there, they had the opportunity to tour the facility and meet with the students. The Queen & Court enjoyed spending time with the students taking photos and getting to know them. Once back at Eli’s, they had a blast decorating their own Eli’s Original Plain Cheesecake for St. Patrick’s Day! Our customers also had the chance to meet the Queen & her Court, while taking some great pictures. It was a great experience and the students at New Horizons, as well as everyone at Eli’s, was happy they were able to visit. In Chicago, we dye our river green…at Eli’s, we turn our cheesecake green! 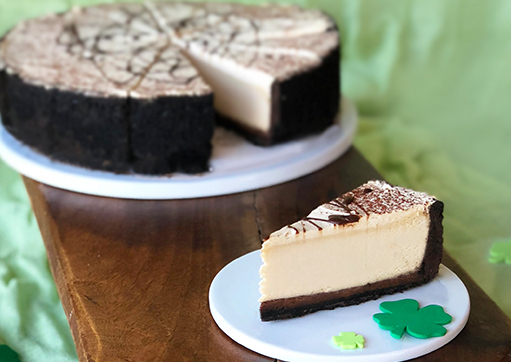 Irish Mint Cheesecake is a fan-favorite that we only make for the season. Minty green cheesecake studded with chocolate chips and topped with chocolate ganache. For the coolest presentation around, use Irish Mint Cheesecake as a fun freakshake ingredient and garnish. What’s a freakshake? It’s a milkshake decorated with the craziest, most over-the-top garnishes imaginable. In a blender, mix 1 slice frozen Irish Cream Cheesecake, 1 cup milk, and two large scoops of ice cream (vanilla or mint) until smooth. Dip the rim of a glass in melted chocolate and roll in green sprinkles. For the garnish, add to a wooden skewer: marshmallows, a fudge brownie, and kiwi chunks, topped off with a whole slice of Irish Mint Cheesecake. Creamy smooth Irish Cream Cheesecake is baked in a dark chocolate crust and layered with chocolate ganache for the ultimate flavor contrast. Jennie C., our resident mixologist, recommends enjoying a slice with a quick and simple cocktail: Add to a glass mug a shot of Irish Cream liqueur, 2 shots of brewed coffee, and fill the rest of the glass with milk. Meet the 2019 Chicago’s St. Patrick’s Day Queen Madeline Mitchell and her court at Eli’s! Enjoy free dessert and beverages. Friday, March 8, 2019. 6701 W. Forest Preserve Drive, Chicago. Eli’s Gift Ideas for Your Galentine, Valentine and Everyone in Between! Gifts for her, for him, for the little ones, or your favorite foodie…Eli’s has something for everyone this Valentine’s Day! Check out our Valentine’s Day Gift Guide for ideas and inspiration for your loved ones this year. Outfit your little Valentine in style with an Eli’s apron and chef hat. It’ll help protect their clothes when they create their own edible valentines with our DIY Valentine’s Day Cuties Kit! Chocolate lovers will adore the Chocolate Hazelnut Crisp Cheesecake. It’s made with our chocolate hazelnut spread, folded into rich dark chocolate cheesecake, topped with more chocolate hazelnut spread and crunchy chocolate confections. Or give them more than one flavor to choose from, all in one cake! Eli’s Chocolate Lover’s Sampler Cheesecake has several slices each of our Candy Bar made with Heath® Toffee Bars, Chocolate Chip and dreamy Chocolate Caramel Pecan Cheesecakes. Pamper your best gal pal with Mini Heart-shaped Cheesecakes! These tiny treats are handmade and hand-decorated. She’ll get 12 hearts, 4 each of 3 different flavors: Raspberry Cheesecake with a housemade raspberry gelee center and white chocolate drizzle, Belgian Chocolate Cheesecake with a chocolate ganache center and a bittersweet chocolate drizzle, and Red Velvet Cheesecake sprinkled with red velvet cake crumbs and a white chocolate drizzle. We’re more than just great cheesecake! Our chefs at Eli’s Bakery Cafe have created a mouth-watering menu for Chicago Restaurant Week, available through February 7th. Lunch is served Monday – Friday, 11am – 2pm; call 773.205.3800 for reservations. It’s a great value that includes a four-course lunch with a cheesecake flight for dessert; taste three different flavors of Chicago’s favorite dessert! It also includes a whole 9″ cheesecake or an Eli’s Cheesecake Cookbook to take home. You worry about the dip, we’ll take care of dessert! 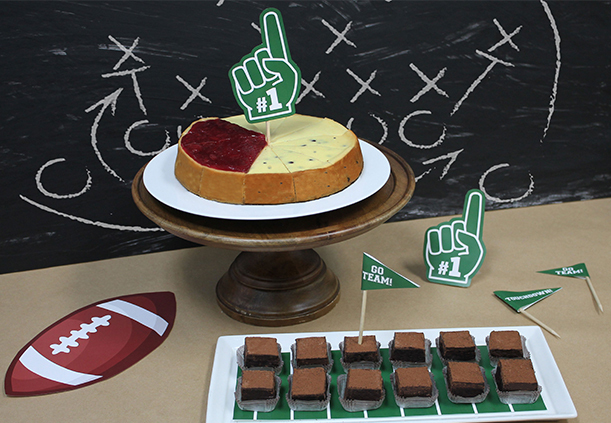 Feed a crowd, or just your home team, with a variety of Eli’s big game-ready desserts. Eli’s Big Game Dessert Tower has something for everyone: a 9″ Original Favorites Sampler (Original Plain, Chocolate Chip, Strawberry Topped, and Candy Bar Cheesecakes), 12 Brownie bites, and our Cutie Dessert Sampler which includes 12 bite-sized dessert bars. 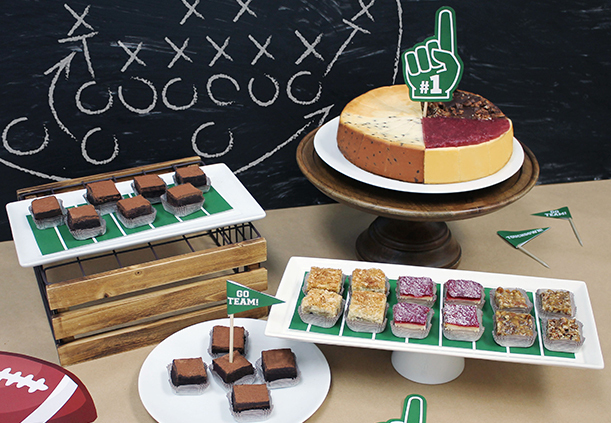 Feed 16 hungry fans with Eli’s Big Game Party Pack, which includes an 8″ Chicago-Style Sampler (Original Plain, Chocolate Chip, and Strawberry Topped Cheesecakes) plus 12 Brownie bites. Style your dessert table like ours: We used a plain chalkboard as a backdrop (we added a chalk drawing of arrows, X’s and O’s) and made our own picks with “#1 fingers” and “Go Team” pennants printed on an inkjet printer, cut out and attached to toothpicks with a hot glue gun. Order by 11am CT on January 31 (be sure to choose this week as your desired shipping week at checkout) to get your desserts in time for kick off. NEW Sweets for Your Sweetheart from Eli’s This Valentine’s Day! Treat your sweetie to some romantic desserts from Eli’s this Valentine’s Day! Everything from Heart-shaped mini cheesecakes, to cheesecake on a stick, to DIY kits, and more! 8” Chocolate-Enrobed Valentine’s Day Cheesecake: Creamy white chocolate cheesecake enrobed in bittersweet chocolate, topped with edible gold hearts and a hand-piped Happy Valentine’s Day message. Serves 12. Cheesecake Cuties: Bite-sized squares of Original Plain Cheesecake, enrobed in bittersweet chocolate, hand-brushed with festive edible gold dust. Enjoy frozen! 12 Cuties per box. Valentine’s Day Dippers (the Valentine’s edition of the Eli’s Dippers that were featured in Oprah’s Favorite Things Holiday list 2018): Frozen Eli’s Original Plain Cheesecake on a stick dipped in rich chocolate, hand-decorated with pink and red nonpareils, edible pearls, and a red chocolate drizzle. Box of 5. Mini Heart Cheesecakes: Raspberry Cheesecake with a housemade raspberry gelee center and white chocolate drizzle, Belgian Chocolate Cheesecake with a chocolate ganache center and a bittersweet chocolate drizzle, and Red Velvet Cheesecake sprinkled with red velvet cake crumbs and a white chocolate drizzle. Box of 12, 4 of each flavor. $39.95 plus shipping. DIY Valentine’s Day Cheesecake Cutie Kit: Make edible valentines! A great activity for the whole family. Dip and decorate your own Eli’s Cheesecake Cuties (1″x1″ bite-sized cheesecake squares) for Valentine’s Day. Includes everything you need to make 24 Cuties at home: 24 Original Plain Cheesecake cuties, Belgian chocolate, coconut oil, 3 types of Valentine’s Day sprinkles, parchment paper, dipping sticks, cellophane bags, and ribbon. Enjoy frozen! See all of our Valentine’s Day desserts at https://shop.elicheesecake.com/category/valentine. Vegan Dairy-Free Desserts for the New Year! We know it’s an oxymoron, but our vegan dessert is so good we couldn’t resist calling it cheesecake! According to Goop, Gwyneth Paltrow’s lifestyle blog, “Eli’s is famous for having the best tofu-based vegan cheesecake in the country.” And we agree! For a healthier take, our chefs have created our delicious Vegan Dairy-Free Belgian Chocolate Cheesecake using rich cocoa, Belgian chocolate, Go Veggie vegan cream cheese, and GMO free tofu, resulting in zero cholesterol, 38% less fat, and 18% fewer calories than regular cheesecake. Our tofu comes from Phoenix Bean, which has been making artisan tofu in Chicago’s Edgewater neighborhood for over 20 years. It’s made by hand with GMO-Free Illinois soybeans.